This originated in Indonesia but is now almost the Dutch national dish. It tastes very good and is one of my favourites to cook for a meal with friends. It looks delicious with the traditional omelet and tomato garnish. You will need a shallow dish of approximately 1.5 litres. Slice the onion into rings and cube the pork. Fry gently in half the butter for 20 minutes with the lid on the pan. Meanwhile cook the rice and also cook the vegetables according to the directions on the packets. When the pork is cooked add the remainder of the butter, the rice and vegetables with salt, pepper, the curry powder and a few drops of soy sauce. Mix well and heat thoroughly. Make a thin omelet with the egg. Turn out, pale side up, onto a board, and cut into strips. 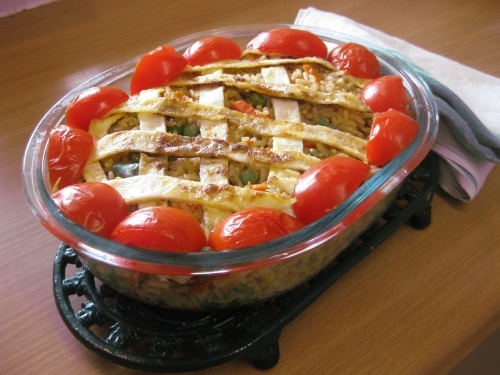 Put the rice mixture into the dish and lattice the top with the omelet strips. Arrange wedges of tomatoes around the edge. Heat under the grill to lightly brown the omelet. I accompany this separately with bananas fried in butter and salted peanuts.